Are There Disposable Diaper Dangers? 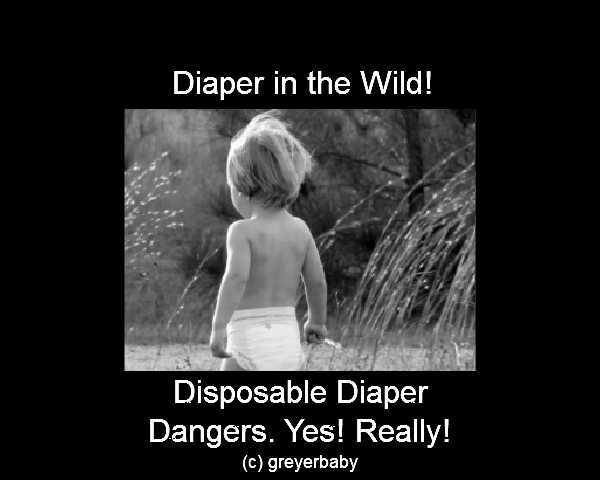 Disposable diapers rule! But mom always said that cloth diapers are best. That’s probably because she never had the choice of disposables that are available today! Ever since disposable diapers became really popular in the 1970s, they have been first choice for (nearly) all moms due to the ease of use and convenience of disposal. They are very absorbent and hold messes better, they come in a large variety of sizes, they have special dry liners to keep wetness off babies’ skin and you just throw them away when used. Disposable Diaper Dangers to Your Pocket! In comparison to cloth diapers, disposables are extremely expensive. It is estimated that a baby will use up to 6,000 disposable diapers in two and a half years, compared to 25-50 cloth diapers. That is a massive difference in cost, although this is offset by the cleaning costs of cloth diapers. 1. Disposables are more likely to cause skin irritations (rashes and allergic reactions) than the natural fibres of cloth diapers. It’s not uncommon to expect some form of diaper rash, but it can be unpleasant and very hard to treat. 2. The chemicals used in disposable nappies are not subject to government controls or independent testing. No one really knows the long term effects of having such chemicals next to a baby’s skin for 2 1/2 years. 3. Disposables work too well! Their highly absorbent abilities prevent babies from feeling wetness. This hinders potty training in older babies, because they don’t have the motivation to get rid of that uncomfortable wet feeling. Evidence suggests that babies who wear real diapers potty train 6-12 months before disposable wearers. 4. Disposable diaper problems that have been reported over the years have included chemical burns, reports of babies pulling disposables apart and putting pieces of plastic into their noses and mouth, choking on tab papers and linings, plastic melting onto the skin and ink staining the skin. 5. In 2000, the BBC reported on a German study which suggested that disposable diapers could be linked to both male infertility and testicular cancer. The research found that the plastic lining in disposable diapers impaired testicular cooling and increased the temperature of the scrotum by one degree. High scrotal temperatures are known to reduce sperm counts in adults. Disposable diapers may therefore have an adverse affect on the development of a boy’s reproductive system. 6. The premier British medical journal The Lancet has reported that hip problems have increased over the last 20 years with the widespread use of disposable diapers, because they don’t provide enough support for correct hip development for crawling and walking. Cotton (cloth) diapers gives more support holding a new-born’s legs in the optimum position for good/correct hip development. 7. A 1999 American study linked disposable diapers to asthma. Six leading cotton and disposable diapers were tested on lab mice; cloth diapers were not found to cause respiratory problems, but the disposable diapers caused eye, nose and throat irritation, including bronchoconstriction similar to that of an asthma attack. 1. Disposable nappies use 90 times the amount of renewable resources (e.g. wood pulp) and 8 times the amount of non-regenerable resources (e.g. one cup of crude oil is needed to make one disposable nappy). 2. No one really knows how long it takes for a disposable nappy to break down – it is suspected that it could be hundreds of years, which means that every disposable nappy ever used and put in a landfill site is still around. With 6,000 nappies being used per baby, this is creating major environmental problems around the world. So far, manufacturers’ attempts to create more biodegradable disposables have failed to convince the environmentalists of their effectiveness. This is where our “landfill site” website topic interfaces with this subject, and is the reason for the inclusion of this article. Disposable diaper history started in 1942 in Sweden with PauliStro. The first disposables they made, had an inner lining built-up from many layers of tissue paper. They first appeared on the market during the 1960s after the pulp mills replaced tissue paper with better alternatives. At that time they were quite costly. Today’s disposable diapers have an more absorbent inner layer and the design is more convenient to use, and for the baby to wear, than before. But, unfortunately, even though these diapers have only been on the market for 40 years, civilization going to feel the effects for thousands of years, until they finally rot away in our landfills. The effect on landfills is one of the biggest issues of this debate. Those who believe cloth is better because disposable diapers are not very biodegradable have a very strong point to make. With the type of materials used and the amount of processing they go through, disposables remain in landfills around 500 years. Several countries throughout the world have banned the disposal of untreated human waste in landfills. They incinerate all the diapers, and that leaves almost no residue. Still, only a few countries are taking these measures. There is no doubt that disposable diapers are wonderfully convenient. However, it is clear that there are also a number of potential dangers. Mom may not have been a scientist, but she may have been right after all – cloth may really be best.